A kerchief (from the French couvre-chef, "cover the head") also known as a bandana or bandanna, is a triangular or square piece of cloth tied around the head or around the neck for protective or decorative purposes. The popularity of head kerchiefs may vary by culture or religion, as among Orthodox Jewish and Christian, Amish, and Muslim women. It is also worn as headdresses by Malay men in traditional occasions such as weddings by the grooms as well as the pesilat. Their headdresses are better known as tengkolok. A "handkerchief" or "hanky" primarily refers to a napkin made of cloth, used to dab away perspiration, clear the nostrils, or, in Victorian times, as a means of flirtation. A woman could intentionally drop a dainty square of lacy or embroidered fabric to give a favored man a chance to pick it up as an excuse to speak to her while returning it. Handkerchiefs were sometimes scented to be used like a nosegay or tussy-mussy, a way of protecting those who could afford them from the obnoxious scents in the street. The popularity of the bandana and kerchief was at it highest point in the 1970s, 80s and 90s depending on one's location. After that its popularity started waning in the west, but some eastern cultures maintained its usage for a while, such as in the Persian Gulf countries. It is largely seen as gender neutral and can be worn by both men and women. Its usage, when wrapped up, was partially replaced by the headband. Colors can be worn as a means of communication or identification, as with the prominent California criminal gangs, the Bloods, the Crips, the Norteños, and the Sureños. 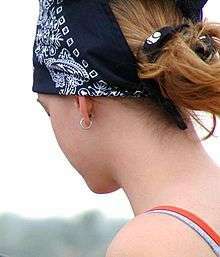 In gang subcultures, the bandana could be worn in a pocket or around the head. In the late 1960s/early 1970s, the Bloods and the Crips wore red and blue paisley bandanas respectively as a signifier of gang affiliation through the display of their gang colors. 1 2 "Definition of bandanna". Merriam-webster.com. 2012-08-31. Retrieved 2013-03-15. ↑ "Bandanna from Dictionary.com". Dictionary.reference.com. Retrieved 2013-03-15. ↑ CURTIS, H. P. (1921). GLOSSARY OF TEXTILE TERMS. MARSDEN & COMPANY, LIMITED. .